We're trying to finish off foods that weren't produced locally this month, and last night I created something strange. I had leftover pork from my mother's 4th of July dinner, with some juice, and thought I'd use it to finish off some Potatoes O'Brien that had fallen into an advanced state of freezer burn. I had a lot more potatoes than I thought, so I needed to add something else. Angelika suggested that I add some of a dessert she'd made, Rotegrütze, which is a delicious mix of mostly red fruits. 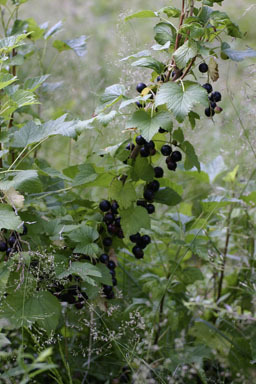 This one was very heavy on the currants - black, white, and red - which we had in our garden. Black currants in the garden. 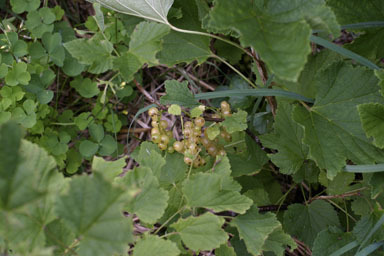 White currants in the garden. It turned out to be the perfect choice, because of the currants in it. Currants are a bit like cranberries or lingonberries, tart fruits that are best mixed with other things. They also have a wonderful multi-level flavor. The black ones - which incidentally are nicely deer-resistant - are too tart to eat directly without making strange faces, but they're delicious when cooked into something. These were just our garden currants. I haven't seen them at stores this year, though BB Farms and Ludgate Farms have both had them in the past. We planted them last year after ordering them from St.Lawrence Nurseries, and Angelika's planning on growing a lot more currants in her orchard. They grow happily in shade, so long as they get a bit of sun. I've been a little worried about the prospect of introducing currants to Americans, but after last night's pork I don't think it'll be too hard to get people to look beyond Absolut Kurant.